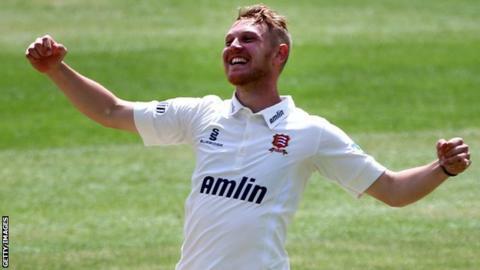 Essex head coach Paul Grayson says youngster Jamie Porter is "refreshing" to have around the first-team set up. The 22-year-old bowler, in his first full senior season, reached 30 wickets for the summer on day two against Gloucestershire on Monday. He only made his first-class debut in September after playing club cricket for Chingford and Fives & Heronians. "He's just so refreshing to have around the place. It's a great story, coming back from club cricket," Grayson said. "He's a good character and he's a very good bowler. He's lively medium, he does something with the ball and he asks lots of questions of batsmen." Jamie Porter - a rising star? Porter, 22, took a wicket with just his fifth ball in senior cricket when he removed Kent's Darren Stevens in September 2014. He has 30 wickets at an average of 19.83 this season. Grayson continued to BBC Essex: "I know his goal is to get 50 wickets this season, and he's well on his way to doing that. "He's having an excellent season, he's willing to work on his conditions and skills - he's a real prospect and we're delighted with the way he's coming on."